SIG Sauer Academy’s new Pistol Mounted Optics Instructor course will likely become the hallmark of pistol optics instruction. SIG Sauer Academy continues to expand their instructional opportunities with the addition of a pistol mounted optics instructor course coming in 2019. Over the last several years, the addition of red dot/reflex optics to pistols has seen an enormous expansion. This growth perhaps saw its biggest growth in the competitive shooting fields highlighted by the United States Practical Shooting Association (USPSA), and the International Defensive Pistol Association (IDPA), but has in recent years expanded well into the civilian defensive pistol market. This expansion in red dot/reflex optic popularity is not a simple trend either. Just as red dot/reflex optics provide rifle shooters incredible advantages over traditional iron sights or magnified optics, the same benefits can be found when using a red dot/reflex optic on a pistol. In fact, some say the benefit of a red dot/reflex optic is experienced more when using a pistol over a rifle or shotgun. These optics can provide incredibly faster and more accurate shooting, designed to draw the shooter’s eye to a specific and lit aiming point rather than pairing up a front and rear sight. The SIG Sauer Academy began operation in 1990 as the SIGARMS Academy. The Academy is dedicated to instructing shooters, armorers, and firearms instructors on SIG Sauer firearms, but also general firearms skills with the shooter’s chosen firearm as well. Though many have believed the Academy will only teach shooting on SIG Sauer firearms, one of the Academy mottos is, “No matter what firearm you shoot, we’ll make you a better shooter, guaranteed.” The Academy provides courses in handguns, shotguns, rifles, precision rifles, and even enhanced tactics. The new SIG Sauer Academy Cover Carry and Micro Pistol course is tailored to concealed carry. 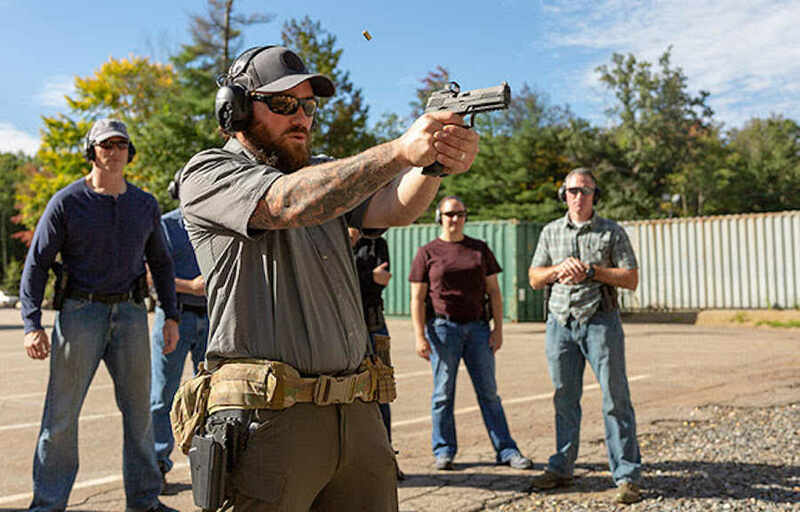 SIG Sauer Academy has just announced the addition of a Covert Carry and Micro Pistol Course to their already impressive list of courses. This new SIG Sauer Academy course is specifically designed for the concealed carry shooter, and highlights the micro SIG Sauer P365 9mm pistol. In fact, course attendees will have the option to borrow a P365 during the course if they desire. This course is a great opportunity for law enforcement investigators, off-duty carry, and civilian concealed carry shooters as well. The Action Target Law Enforcement Training Camp packs superb training (photo by Action Target). Action Target, Inc. is best known for producing outstanding indoor firearms ranges and individual targets from simple paper to rifle-grade steel. However, for the last 20 years Action Target has taken their products to the next level by offering high-caliber firearms to the law enforcement and military community. The Action Target Law Enforcement Training Camp (LETC) is designed to provide next-level, real-life shooting scenarios taught by professional instructors with impressive resumes. The LETC is a one-week course covering a wide variety of real-life shooting encounters. Unlike static ranges, that can only be enhanced for realism so far, the LETC shooting course takes shooters from the static range and runs them through outdoor shooting exercises. These shooting drills are meant to provide critical instruction and useable feedback to law enforcement and military shooters. The shooting drills are unlike most other firearms training courses and should quickly shatter shooting myths from hard-core realities. Affordable Glock Armorer Training From AGI! AGI is a very respected instruction provider firearms maintenance. The Gen 4 models, and the latest Glock 42 and Glock 43 pistols as well. Typically, this training requires a person to be in law enforcement, military, or an employee of a FFL to receive instruction from a certified Glock representative for Armorer training. The American Gunsmithing Institute is a well-recognized and highly reputable organization for gunsmithing, armorer, and general firearms maintenance instruction. The BlueSheepdog Crew has examined some of the materials offered by AGI and have found them to be professionally produced, informative, and very detailed. The AGI instruction manuals can be a great resource in maintaining firearms for both professional and personal use. Concealed Nation is an organization devoted to promoting responsible concealed carry of firearms by both professionals and civilians. The BlueSheepdog Crew are strong supporters of off-duty and civilian concealed carry of firearms. However, we have no affiliation with either AGI or Concealed Nation, and the opinions expressed by either organization are their own and may not reflect the opinions of the BlueSheepdog staff. Recently, Ashbury Precision Ordnance has introduced their Riflecraft Field Shooting Clinics, Workshops and Courses to advance the art and science of precision rifle shooting. Ashbury Precision Ordnance (APO) is a very highly respected manufacturer of precision rifles and rifle chassis. The APO SABER®-FORSST® modular rifle chassis has been mentioned in the same conversations as premier manufacturers Accuracy International and McMillan. The new Riflecraft Field Shooting Clinics cover a wide range of topics and shooting distances allowing the student to somewhat guide their own educational experience. 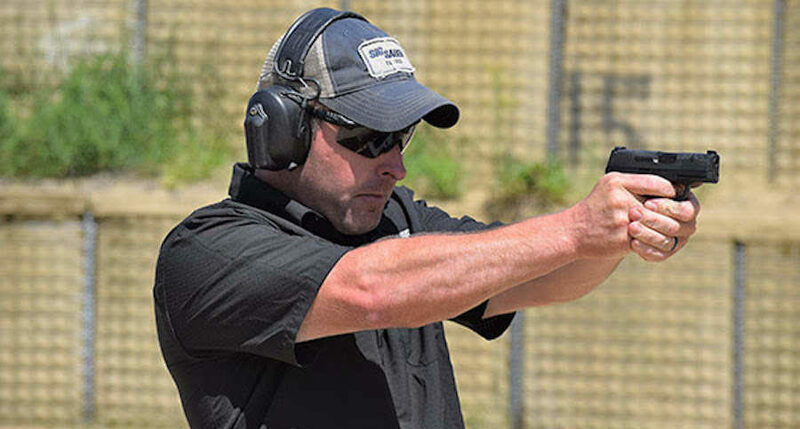 The Ashbury Precision Ordnance training facility in Virginia is top of the line and gives shooters the opportunity to engage steel targets at distances out to one mile and beyond. The Force Science Institute (FSI) just published a detailed study through the Law Enforcement Executive Forum on the benefits of the passenger side approach when conducting vehicle stops. The authors here at BlueSheepDog (BSD) have long been preaching the tactical benefits of this approach from our own experiences, and we are very excited to see a scientific study supporting this critical skill. Vehicle stops have often been labelled “routine” police work by the media and those not in law enforcement. Law enforcement officers have often strongly opposed this description recognizing the inherent dangers of this duty. However, the BSD Crew recognize truth in both positions. When examined together (routine, and dangerous) a proper context can be established to understand this vital duty more completely. We’ll discuss this issue at the end of the article. Officer Safety Video: Ohio Frisk Turns Deadly! 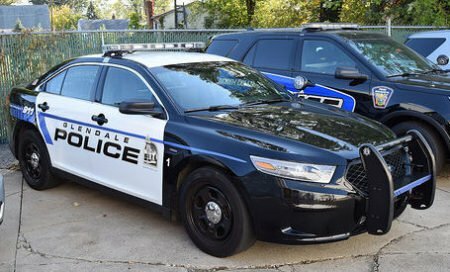 A Glendale, OH Police cruiser (photo from flickr). On March 29, 2016 at around 1725 hours Glendale, Ohio police officer Josh Hilling responded to a pedestrian walking down a very busy Interstate 75 highway. Glendale is only a village of about 2150 people, but it is a part of the suburban sprawl of Cincinnati. In the few minutes of contact, Officer Hilling is trying to determine where the man came from, where he is going, and where he has been staying. The man has the appearance of a drifter, and everything at first appears to be a rather routine citizen contact. Pedestrians are prohibited on Interstate highways, and Officer Hilling tries to explain that it very dangerous for the man to be walking on the highway. When Hilling takes the man to his patrol car, he tells the man he’s going to frisk him for “officer safety”. What happens next nearly costs Officer Hilling his life, and will be the focus of this BlueSheepDog Officer Safety training post. Civilian drones are becoming increasingly popular (photo on Pintrest). 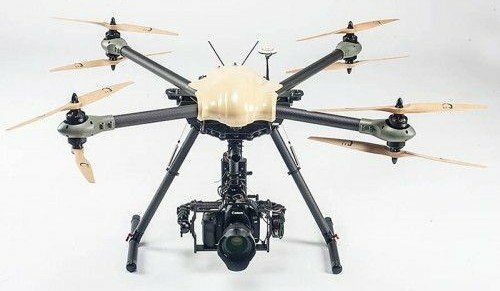 Drones, or unmanned aerial vehicles (UAV) may have only come into the common lexicon in the last few years, but they are rapidly becoming a major concern for the public and law enforcement. Previously, the idea of drones was left to science-fiction movies, but the potential uses of a drone have expanded well beyond the mysterious as released military videos have proven the incredible surveillance and even attack capabilities of these UAV’s. Armed civilian aircraft have been posted to Youtube and immediately garnered the attention of Federal and local authorities, but what about a simple aerial surveillance platform? More and more civilian drones are entering the airspace and the potential for privacy violations or compromised law enforcement missions is growing. 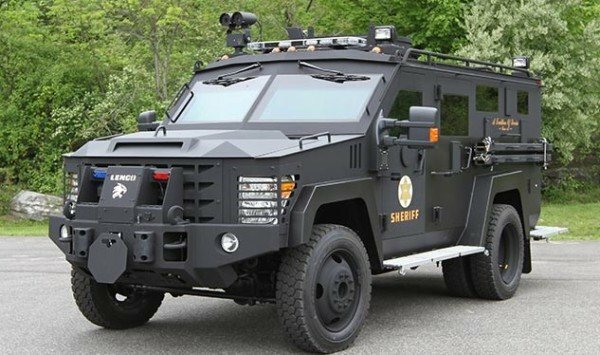 The use of armored vehicles, like this LENCO Bear Cat, increased after 9-11, and can assist officers in the overall concept being studied. This is the third installment of our series examining the concept of, “Speed, Surprise, and Violence of Action”. In Part I we detailed our opinions of the good and bad of Speed. In Part II we evaluated how Surprise can be both beneficial and costly. Now, in Part III, we will evaluate the term, “Violence of Action”. Words provide powerful images in the American dialogue. This is even more important when the government (police) interact with the citizenry. Our country’s foundation was on the principles of liberty and freedom from tyranny. Even 240 years later, those principles ring true, and as American law enforcement we should cautiously guard our training philosophies to prevent the good and public-endorsed enforcement of the law, to turn into the over-bearing weight of a powerful government. The use of armored vehicles, like this LENCO Bear Cat, increased after 9-11. SURPRISE – is probably the most misunderstood component of this entire tactical philosophy. Defined as, “an unexpected or astonishing event, fact, or thing”, Surprise can be a very valuable ally to police tactical operations. Surprise can also be a very shifty and non-trustworthy companion, changing sides in a heartbeat.